In the whisky department, we all have a familiar friend or two… This would certainly be the case for the Oban 14 year. It also is one of those whiskies that just keeps on resurfacing… Our original Whisky tasting group enjoyed it in August 2011 and June 2013... and it cropped up in our Whisky Ladies November 2015 tasting session. There is a reason for it – you know what you are going to get with Oban. Its profile has managed to maintain a certain consistency over the years. In my case, it is an early evening drink of choice with a dear friend in Singapore. I see Oban and I think of some most enjoyable evenings with merry conversations accompanied by a dram or two with her. Such a contrast from the Nikka which was so unpredictably contradictory… to the point of almost being contrary. 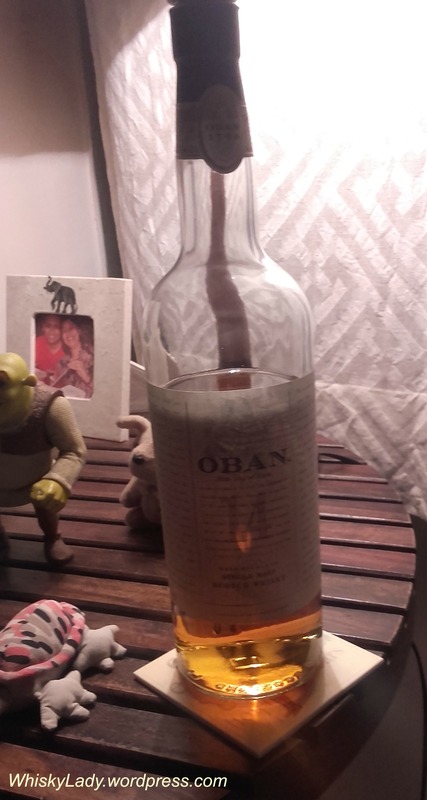 Oban is an elegant, something to enjoy with friends early evening, it isn’t complicated, it isn’t challenging however it is just exceedingly enjoyable. This entry was posted in Highland, Scotland and tagged Highland, Oban 14 year, Oban 14 year tasting notes by Carissa Hickling. Bookmark the permalink. You are completely right. It’s a bit of a classic this one. Why have we not reviewed it yet? Some relatable tasting notes, as always.